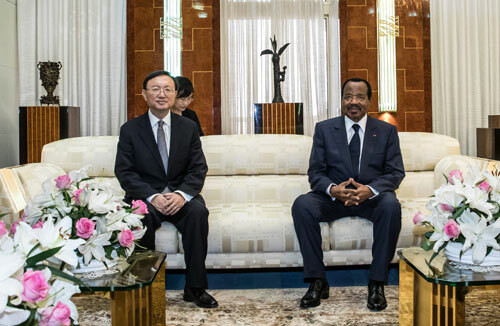 On January 18, 2019 local time, Special Representative of President Xi Jinping, Member of the Political Bureau of the Central Committee of the Communist Party of China (CPC) and Director of the Office of the Foreign Affairs Commission of the CPC Central Committee Yang Jiechi met with President Paul Biya of Cameroon in Yaounde. Yang Jiechi conveyed President Xi Jinping's warm greetings to Paul Biya, and expressed that China-Cameroon friendship enjoys a time-honored history and has withstood the test of time and international vicissitudes. Last year, Mr. President successfully visited China, and attended the Beijing Summit of the Forum on China-Africa Cooperation (FOCAC), reaching important consensus with President Xi Jinping. China-Cameroon relations have stood at a new historical starting point and embraced significant development opportunities. As Special Representative of President Xi Jinping, I visited Cameroon with the aim to enhance integration with the Cameroonian side, implement the important consensus reached by the two heads of state, facilitate the effective implementation of the results of the FOCAC Beijing Summit in Cameroon, and promote China-Cameroon friendly cooperation to higher levels. Yang Jiechi pointed out that China and Cameroon should expand friendly exchanges at various levels, advance the joint construction of the Belt and Road Initiative, deepen practical cooperation in various fields and strengthen people-to-people and cultural exchanges. The Chinese side is willing to assist Cameroon in developing economy and improving people's livelihood within its capacity, continuously support each other on issues concerning respective core interests and major concerns, and enhance communication and coordination on international and regional issues. Paul Biya asked Yang Jiechi to convey his warm greetings to President Xi Jinping, and expressed that the Cameroonian side attaches great importance to developing relations with China, thanks the Chinese side's long-term strong support and assistance, and sincerely hopes that China will make greater development achievements. Highly appreciating the Belt and Road Initiative, the Cameroonian side supports cooperation under the FOCAC framework, and stands ready to work with the Chinese side to well implement the outcomes of the FOCAC Beijing Summit, so as to push bilateral relations to a new stage. The Cameroonian side is willing to further intensify communication and coordination in multilateral affairs with the Chinese side. During the visit, Yang Jiechi also met with Prime Minister Joseph Dion Ngute and Foreign Minister Lejeune Mbella Mbella of Cameroon.